Abit's MAX line of motherboards has a strong heritage in the industry, and it has continued this with its next board based on the X38 chipset. While the IN9-32X MAX was the first Abit board to use digital PWMs, and the IX38-MAX uses a second generation digital PWM system based on a newer smaller and more robust BGA design. They also only use just 15 percent of the power of the previous generation making them run far cooler. However it is only a five phase design, compared to DFI's eight phase using the same second generation digital PWMs. Some may be disappointed to find out the new MAX board shuns the chipset transversing heatpipes present on the nForce 680i SLI board and has an actively cooled northbridge instead. Abit claims that the cutting edge overclockers are less concerned with noise and more with performance anyway, and will likely change the northbridge cooler; the same expectation DFI had of its RD600-based ICFX3200T2R/G. The digital PWM cooler is now larger and can handle a 40mm fan (provided) for extra cooling. The X38 chipset kicks out even more heat than the insanely hot nForce 680i SLI, 36.7W, but the twin heatpiped northbridge cooler, akin to something you'd put on a socket A/370 CPU, can dissipate some 75W. Finally, if you're still intent on buying MAX you'll have to plump for some DDR3 memory. Serious motherboards and serious overclocking makes for some serious cash spending, unfortunately. But don't fear! 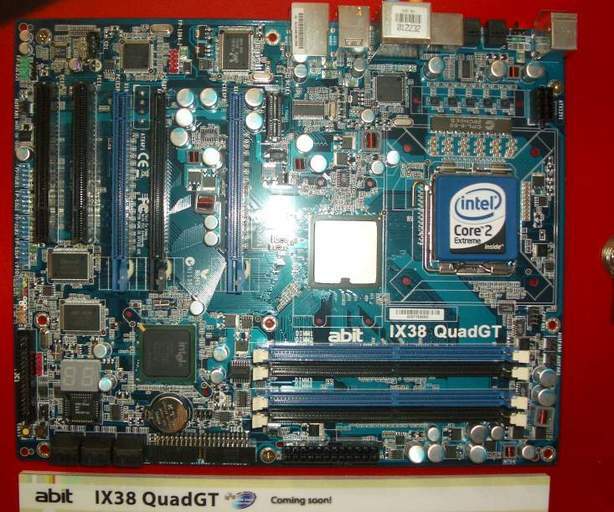 For the rest of us the QuadGT version of the X38 might not have all the dandy features of the IX38-MAX, but comes with DDR2 and heatpipes strewn across it instead. Quiet, cheaper, and still tipped to be highly overclockable. While the MAX version will likely be IN9-32X MAX price territory, the IX38 QuadGT should be the one to aim for at a reasonable price for an enthusiast's board - somewhere around $250/£160-180, we're told.